Our rates vary from season to season, so please be sure to take notice of the dates when booking your stay with us! Our King Rooms are comfortable and modern. Each have one king-sized bed, new flat screen TV with digital cable, mini-fridge, coffee maker with complimentary coffee, air conditioning and free WIFI. Our Queen Rooms are cozy and clean. Each have one queen-sized bed, new flat screen TV with digital cable, mini-fridge, coffee maker with complimentary coffee, air conditioning and free WIFI. Our Twin Rooms are perfect for 2 people adventuring together! Each have two single beds, new flat screen TV with digital cable, mini-fridge, coffee maker with complimentary coffee, air conditioning and free WIFI. 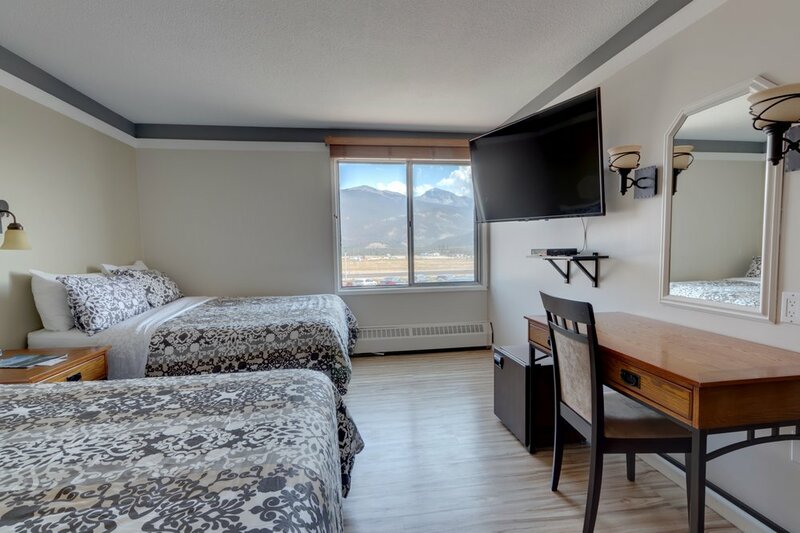 Our mountain view rooms have multiple options and include spectacular views of the Canadian Rocky Mountains! Each include new flat screen TV with digital cable, mini-fridge, coffee maker with complimentary coffee, air conditioning and free WIFI. All mountain view rooms are available at the same rate. Pet Friendly Rooms are limited. Please note that reservation cancellations are subject to a $15 reservation fee. Advance reservations must be secured with the first night payment to be guaranteed past 4:00 P.M. the day of arrival. Cancellation notification must be received at least 48 hours prior to the date of reservation in order to qualify for a refund. Group and tour reservation policies may be acquired by phoning the hotel reservation desk. The Astoria Hotel is a Non-Smoking facility. All of the guest rooms are accessible by stairs (one flight) and there is no elevator. Pet-friendly rooms are limited and available upon request.